New subscribers this week include Florence Codine, Alexander G. Lynn, Mark Callahan, Andy Newman, Arnie Tescher, Arthur Black, Mutaz Osman and Paul Torongo. Welcome aboard! We have 1,677 email subscribers, plus 244 followers on Facebook. Happy Birthday, E-Sylum! The first issue of our newsletter was published September 4, 1998. We've come a long way. Many thanks to our subscribers and contributors, who make it all worthwhile. This week we open with some more information on the NBS annual meeting, and an announcement of the next Kolbe & Fanning numismatic literature sale. 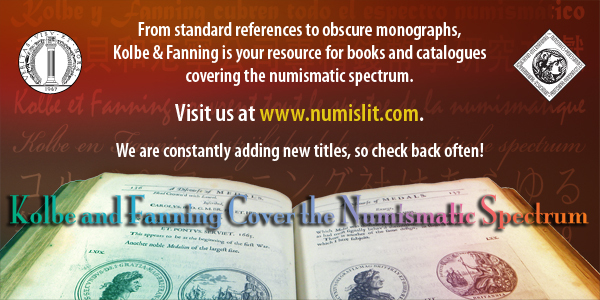 Next up are announcements of a record number of new numismatic books for bibliophiles, researchers, and collectors alike. Other topics include the numismatic legacy of L. G. Kaufman, coins from the Eric Newman collection, the Northwest Territorial Mint, and numismatics on exhibit at the National Museum of Ireland. To learn more about plugged coins, John Story Jenks, Wisconsin Military and Civil Medals, communion tokens, and Papal Bullas, read on. Have a great week, everyone! The Numismatic Bibliomania Society annual meeting for 2013 was held at the ANA convention on Thursday, August 15, in Room 24 of the Donald Stephens Convention Center in Rosemont, Illinois. In attendance were approximately 40 hard-core bibliophiles, and the usual small complement of lost convention-goers wandering by seeking other meeting rooms. Outgoing President Dan Freidus handed the gavel to newly-elected President Marc Ricard, who promptly introduced Guest speaker Q. David Bowers, who was double-booked for the PCGS luncheon in an adjoining room. Dave gave a brief, but fascinating history of the development of the hobby of collecting numismatic literature, starting with the early 1950s, when he developed a respectable numismatic library simply by saving literature that other collectors discarded. 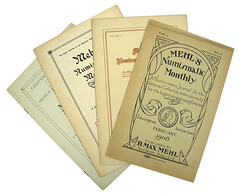 At the time, he could count all of the other serious collectors of numismatic literature on his fingers, but the hobby developed rapidly, so that by 1981 a Kolbe numismatic literature auction could be a front-page headline event in Coin World, then by the mid-1990s, a numismatic library could drive a suite of four major auctions by Bowers and Merena Galleries. Dave then dashed off to the PCGS luncheon, but not before leaving behind a series of autographed copies of his books for sale in the NBS fundraiser auction. 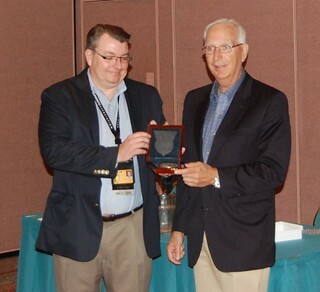 The George Frederick Kolbe Award for lifetime achievement in numismatic literature was presented, appropriately enough, to past president Dan Hamelbergs superb, not only for the creation of his superb library, but also for his many efforts, often done quietly, behind the scenes, to support the hobby. The report from Treasurer David Sundman showed the NBS again solvent and again running a surplus, albeit smaller than recent surpluses, due to smaller intakes at the NBS benefit auction, and the very popular decision to begin printing The Asylum in full color. Consequently, the NBS board made a decision to raise the annual membership dues for the first time since 1988 (although the raised dues of $20 U.S. and $25 foreign remain among the lowest of the specialty clubs). Other speakers then took the podium. Elizabeth Hahn (who became, with her election to the vice presidency, the first female elected officer in NBS history), spoke in her capacity as ANS Librarian to thank the NBS for a donation, as did Kendra Johnson, ANA Library Manager. Bill Bugert then spoke on lessons he had learned as a writer, photographer, editor and publisher of a series of highly-regarded books on liberty seated coinage. Among the most important of these lessons regarded the photography of coins, and Bill offered to share the secrets of his home photography studio, which he assembled for less than $1,000. The meeting closed with the traditional benefit auction. Seven donors contributed more than 30 lots of books, which the NBS members bid up to $3,500 for the benefit of the Club. (A more exhaustive report on the proceedings of the NBS Annual meeting will be provided for the record in the next issue of The Asylum). Kolbe & Fanning Numismatic Booksellers have announced their 130th mail-bid sale of important numismatic books, which will close on Thursday, September 26. 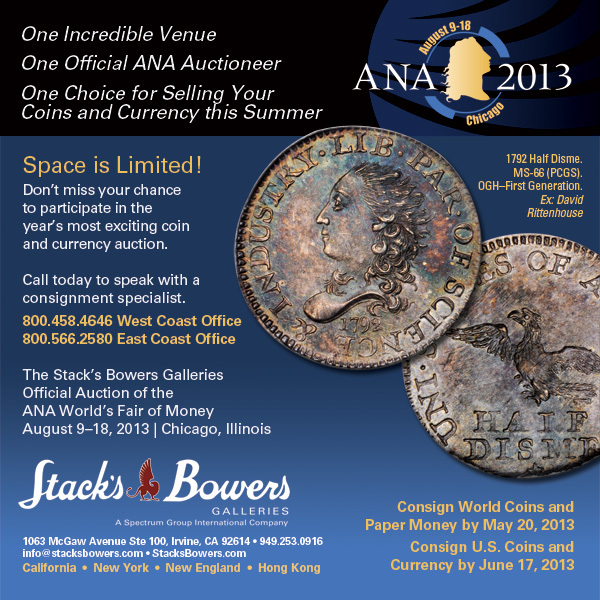 The sale features over 600 lots of material on ancient, medieval, foreign and U.S. numismatics. —An 1879 Holograph Letter from A. Loudon Snowden on Electrotyping Coins in the Mint Cabinet Collection (lot 586). Bids may be placed via mail, email, phone or fax. The illustrated catalogue has been sent to customers on the Kolbe & Fanning mailing list. A limited number of copies remain available for purchase for $15 postpaid. The catalogue also may be downloaded in PDF form from the Kolbe & Fanning website at www.numislit.com. For full bidding instructions, please see the catalogue and read the terms of sale. 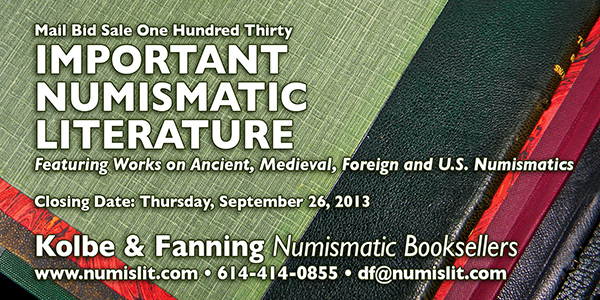 For more information or to place bids, please contact David Fanning at df@numislit.com or (614) 414-0855. Thank you, and we look forward to your participation! 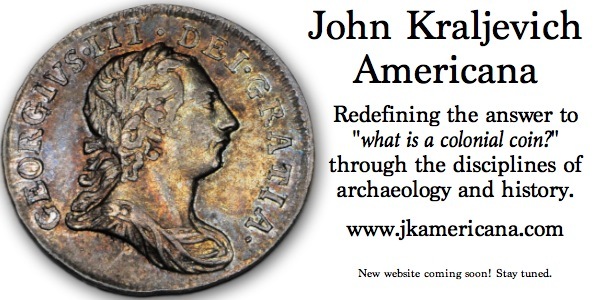 The new book, John Story Jenks, A Great American Coin Collector, by Kevin Flynn is now available. The book is 6 by 9, 80 pages. When we think of the great coin collections through the course of our history, we normally think of those of Louis Eliasberg, T. Harrison Garrett, John Pittman, King Farouk of Egypt, Colonel Edward Howland Green, John J. Ford, J.M. Clapp, Waldo Newcomer, and Virgil Brand to name a few. Does a great coin collection make a great coin collector? Are the two distinguishable? What attributes define a great collector? For example, the ability to grade and select quality coins can demonstrate the collector’s knowledge of the coins themselves and skill to judge those characteristics of a grade including strike, luster, color, toning, hairlines, contact marks, wear, and most importantly eye appeal. Seeking the finest known or highest grades takes patience, attention to detail, and determination. As coins normally represent historic people, places, events, an important attribute to being a great collector is an integral understanding of their collection, including historical relevance and symbolism of the designs used for the coins. As the essence and objective of a hobby is the advancement of the hobby through the expansion of knowledge for the benefit of the hobby. Those who embrace such a commitment to the hobby are the true great collectors. 1. An extensive coin collection in his field of study. For Jenks this primarily focused on Ancient and World coins. 2. A comprehensive knowledge of the historical facts surrounding their coins. Jenks’s 1906 book “An Account of Some Coins in a Private Collection,” displayed this comprehension. 3. A willingness to share that knowledge for the benefit of the hobby. Jenks was an integral part of his coin club, acting as its Vice President for almost 20 years and contributing his knowledge to teach others. 4. The ability to identify and select quality coins, some of the finest known today. 5. The ability to preserve those coins in a near perfect original state. 6. His philanthropic and charitable contributions to society. After Jenks retired in 1893, he was part of many clubs and organizations for the betterment of society including the Board of Education of Philadelphia, the Society for the Employment and Instruction of the Poor, and the Society for Organizing Charity to name a few. This general attribute cannot be overlooked, it is a quality that is not often seen. It is the essence of what our hobby should be. This book explores Jenks’ life, his contributions to the hobby and society, his collection, the intimate knowledge he had of his coins and their history, and Jenks displayed those qualities that we should all aspire to. Retail for the softcover is $12.95. To order, send a check or money order to Kevin Flynn, P.O. Box 396, Lumberton, NJ 08048. Please include $5 for media shipping or $10 for first class shipping. The Experiments on Aluminum Coinage book by Kevin Flynn is available now. The book is 8 ½ by 11, 60 pages. Softcover $22.95. The U.S. Mint experimented with aluminum in coinage from 1855 through 1975, but it never used it in production for our coinage. For coinage, aluminum has many benefits over other metals, it has a low density making it light, when it is exposed to air it forms a thin layer of oxide that adds a protective layer, greatly improving its resistance to corrosion, and is durable, making it more resilient to wear. Aluminum is the most abundant element in Earth’s crust, but is almost always found in combined states with other metals. The evolution in the process of separating aluminum into a pure state is important to the consideration and cost of using aluminum in coinage. As all aluminum coinage, except for the 1974 aluminum cent, was struck as patterns, this book studies the production of patterns in general during this period on their production and distribution. For example, an important question is why were aluminum patterns struck for denomination for each year between 1868 and 1875. Was the Mint striking to test this alloy or simply striking patterns for sale to collectors, or striking them for Mint personal? 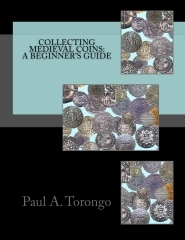 This book explores all aspects of the Mint’s experimenting with aluminum for coinage. As this is a very specific subject, only a 100 softcovers will be printed in the first printing. Retail for the softcover is $22.95. To order, send a check or money order to Kevin Flynn, P.O. Box 396, Lumberton, NJ 08048. Please include $5 for media shipping or $10 for first class shipping. See this and other books available at www.kevinjflynn.com . The Authoritative Reference on Twenty Cents book by Kevin Flynn is available now. The book is 8 ½ by 11, 88 pages. Softcover $29.95. The Liberty Seated Twenty cents is the shortest coin series in U.S. Mint history and the only series of the twenty cent denomination. 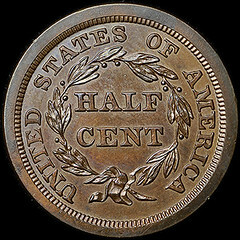 The primary purpose of this book was to create a complete and comprehensive reference for the Twenty cent series including all die varieties, history, collecting, historical documents, and hot topic such as the 1876-CC Twenty cent piece, 1875-S so called proof, proof counts, and the 1875 small date proof. The die variety section of the book includes 2 doubled dies, 7 misplaced dates, 1 repunched date, and two repunched mint marks. For each die variety listed, detailed macro photos make identification much easier. Most of the varieties include multiple photographs showing different details. Included also for each variety is a detailed description of the variety, diagnostics, including die markers such as die cracks, scratches, clashes which can make identifying the variety easier, pricing, and cross references. Many new archive letters were uncovered relative to the Twenty cent series and are included. This greatly helped in the analysis of the history section and shed new details on the series, especially for why the design was chosen and why it was terminated. The date-by-date section offers an analysis of each date including scarcity, striking characteristics, world history which occurred that year, hot topics, comments, current values, prices realized from Heritage Auctions, and the certified population counts from PCGS. 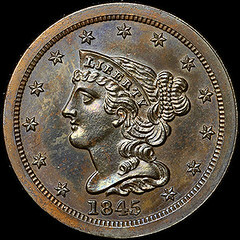 The Hot Topics section contains a several detailed studies on the Twenty cent series including an analysis of: The 1875 Small date pattern that is called a proof, understand why this coin which was struck as a pattern is most likely a proof; The 1875-S so-called proof, learn why this is not a proof; The 1876-CC Twenty cent piece, learn all the facts and theories regarding one our greatest rarities; The number of working dies used; A complete analysis Twenty cent proof counts, how several of the currently accepted proof counts are incorrect, see the correct counts. Only a limited number will be printed. Retail for the softcover is $29.95. To order, send a check or money order to Kevin Flynn, P.O. Box 396, Lumberton, NJ 08048. Please include $5 for media shipping or $10 for first class shipping. See this and other books available at www.kevinjflynn.com . The Off-Center and Multi-Denominational Clashed Die book by Kevin Flynn is now available. The book is 8 ½ by 11, 112 pages, and tons of photographs. Softcover $29.95. The off-center and multi-denominational clashed dies are two of the rarest types of die varieties created at the United States Mint. There are only 6 verified off-center and only 6 verified multi-denominational clashed dies for all 19th century coinage. Of the 41 books the Flynn has written, this was one of the more difficult and time consuming, as it required the mind-boggling task of trying to figure out how they occurred. The first part of the book explores clashed dies in general. This type of die variety is normally created when the working dies are in the coining presses. A clashed die normally occurs when the obverse and reverse dies in the coining press strike each other without a planchet between them. 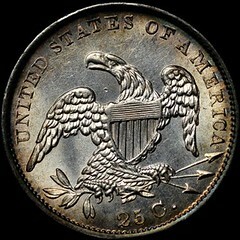 This was especially common on some series such as the Three cent nickel. It was originally accepted by most that the outline of the design elements were left on the opposing working dies from the edges of the design elements. This theory was proved invalid. The remnants of the clashing is a result of the fields being compressed. A complete analysis was done to prove this theory valid. Off-center clashed dies required the working dies to be off-center in relationship to each other when they clashed together. 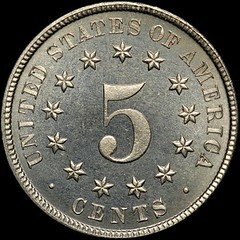 In all U.S. coin series, there are only 6 validated off-center clashes known; 3 on Indian cents, 2 on Two cent coinage, and 1 on Morgan Dollars. The main question for this type of variety is whether they were created in the coining press or during some other period in the die making process. There are several coins that were believed to be off-center clashed dies, but do not have the physical diagnostics to classify them as such. For example, there have been over 40 Morgan Dollar die varieties classified as off-center denticle clashing. 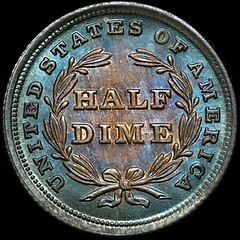 For the 19 Morgan Dollars examined for this book, all but one of these has been refuted as an off-center clashed die. Multi-denominational clashed dies occur when working dies of two different denominations strike each other without a planchet between. In all U.S. coin series there are only 6 known off-denominational clashes known; four of which occurred in 1857. One of the primary questions for this type of variety is whether they were intentionally made or simply the result of an accident. Another issue is how they could have occurred. Retail for the softcover is $29.95. To order, send a check or money order to Kevin Flynn, P.O. Box 396, Lumberton, NJ 08048. Please include $5 for media shipping or $10 for first class shipping. See this and other books available at www.kevinjflynn.com . 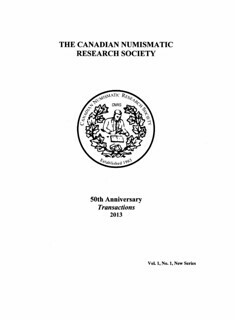 The Canadian Numismatic Research Society is proud to announce the latest edition of the journal the Transactions. A special publication, to mark the 50th anniversary of the founding of the CNRS, the New Series Transactions has been caringly laid out with never before published Canadian numismatic material carefully researched and fully illustrated in superb colour. 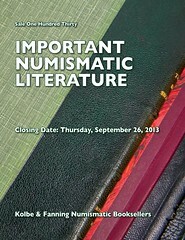 This edition will be printed in a limited amount and available for a restricted period of time. If interested please place your order immediately. The Transactions is 89 pages, card covered and perfect bound. The orders have been coming in from word of mouth but notices will be in the upcoming RCNA journal and the Numismatica Canada September edition. Shortly after the orders are assembled (I am firmly aiming for the beginning of November) the edition will be mailed and that will be that. We do not plan on holding stock. This new book is superior to any state and local medals book ever published with 174 full color 8x11 pages printed on 70# digital white paper. A coil binding making this book both user friendly and durable. Over 300 listings of which well over 200 are fully illustrated. Listings include physical descriptions with color scans of the front and back. Historical footnotes and photos are also included where appropriate. 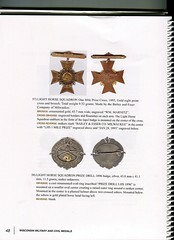 There are many rare and unique medals listed in this book. 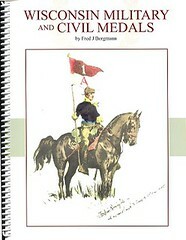 The cover design features a colorized copy of a rare and virtually unknown Fredric Remington drawing which was presented to the Milwaukee Light Horse Squadron by Remington on their twentieth anniversary in 1899. The listings include more than just the medals earned by veterans. To prevent future misattributions both accidental and intentional souvenir medals are included that were sold to the public to fund celebrations and a monument plus some fobs and badges that were sold at the summer camps of old. Reproductions are listed in the hope that this information will save collectors more than a few dollars. There are also some very rare and interesting civilian medals in addition to a section of presentation badges. The new order of this catalog begins with the general issues of the Wisconsin National Guard proper, then issues of the individual units. Next a listing of some interesting and unusual medals that have been un-cataloged until now. An extensive listing of state and local medals issued for war service. To transition from the military to the civilian sections there is a listing of the University of Wisconsin Corps of Cadets (R.O.T.C.) issues and an extensive alphabetical listing of medals from the St. John?s Military Academy. For information contact borgmannfj@hotmail.com Price is 40.00 postpaid cash, check, money order or Paypal. Awarded “BEST SPECIALIZED BOOK, Tokens and Medals” (2013, Numismatic Literary Guild)— Abraham Lincoln: Beyond the American Icon, by Fred Reed. A massive and colorful 464-page study overflowing with 1,400-plus images. Hardcover. Order online for $29.95 at Whitman.com (or call 800-546-2995). Egypt is not Cairo as we are learning, once again, from the daily news. And the same goes for antiquity. To reduce Egypt to Alexandria means to neglect a substantial portion of the country. Egypt’s prosperity was created in the countryside, to be more precise in the nomes as we call today the administrative subdivisions already attested in the third millenium BC. They were not only administrative divisions, but every single nome had its own cultic rites reflecting its identity with specific deities. And the nome coinage of the Roman Imperial period refers to these deities. It is impressive how much Manfred Weber and Angelo Geissen present to their readers en passant. Of course this book is a complete type catalogue. But the information regarding the interpretation of the coin designs startles even excellent experts of the Roman Empire demonstrating how profoundly the Roman administration in Egypt became acquainted with the local customs. 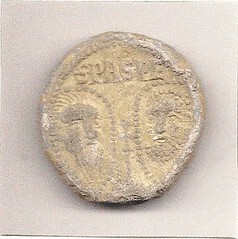 Nome coins were issued only under very few emperors and only on particular occasions. 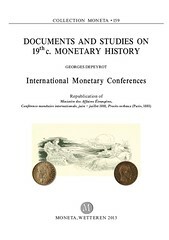 With sound reasons the authors suggest to link these coin series with the decennial anniversary of enthronement seizing thus on an ancient Egyptian feast. As far back as in the times of the pharaohs the whole country represented by the nomes rendered homage to the pharaoh on occasion of the festival of Sed. Antoninus Pius appears to have referred to this traditional ceremony when celebrating the wedding of Marcus Aurelius and Faustina. Certainly that was the reason why nome coins were issued during his reign. 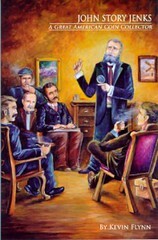 The authors explain what exactly was shown on the nome coins portraying one nome after the other. First they give a short general introduction into the nome presenting the nome symbol, the most important towns, its location and historical-economical relevance. Then follows a much longer part dealing with the local cults. After this the reader finds a catalogue of all those coin types which name this nome. In the section ‘Ergebnis’ (‘result’) an interpretation of the images on the coins is given. The photos of the coins are collected on thirty plates. 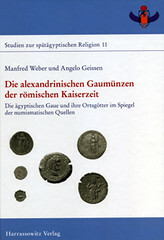 Manfred Weber, Angelo Geissen, Die alexandrinischen Gaumünzen der römischen Kaiserzeit. Die ägyptischen Gaue und ihre Ortsgötter im Spiegel der numismatischen Quellen. XIV + 406 p. 123 images on 30 pl. 29.7 x 21 cm. Hardcover. Harrassowitz Verlag, Wiesbaden, 2013. ISBN 978-3-447-06846-8. 124 euros (D), 127.50 euros (A), 167 CHF. Recently, in the 14 July 2013 issue of this journal, Michael S. Shutty Jr. announced the publication of his numismatic work, "Communion Tokens: A Guide to Collecting Scottish, Canadian and United States Tokens." He noted the book is a "Trade Paperback," has 137 pages and has a list price of US$ 14.95. He also included information about the history and use of such tokens. I recently purchased a different book / pamphlet for a much more restricted field of use for communion tokens, also published this year. TITLE: "Zugang zum Abendmahl. 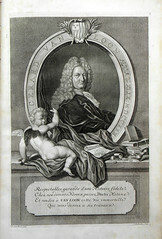 Méreaux im deutschen Refuge und in anderen deutschsprachigen Gemeinden." Being very free with a translation and trying to define the scope of the work, I would say: "Admittance to Communion. (Communion) Tokens in the German-Speaking Diaspora." PUBLISHED AND COPYRIGHTED BY: Verlag der Deutschen Hugenotten-Gesellschaft e. V. That is to say: Printing House or Division of the German Hugenotten Association (registered Association). FORMAT: 17 X 24 CM. Card covers. LIST PRICE: Euros 14.80 plus postage. 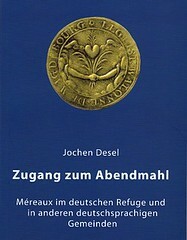 The work is Volume Number 49 in the series of publications issued by the German Hugenotten Assn., mostly devoted to the history of the Protestant French Reformed Church and kindred religious groups in Germany over the past several centuries. Jochen Desel is a Deacon Emeritus of the Church, former president of the German Hugenotten Assn. and active with the Hugenotten Museum in Bad Karlshafen in Hessen, with a special interest in numismatics pertaining to the Hugenotten. 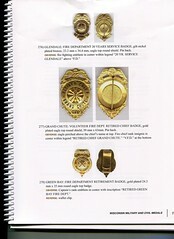 The catalog starts out with around 50 pages of historical information about the Church and its use of tokens. 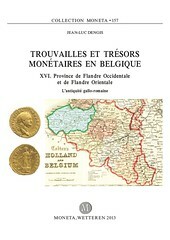 The very first paragraph takes up the word Méreau: "Méreau (Plural méraux, mérraux), marreau (Plural marreaux, marraux), maros / marots (Plural), marque; english: communion token; niederländisch: avondmaalsloodje ..." I continue: were the names used for round or sometimes four sided tokens (Jetons) of lead or some other base metal which had already been in use since the middle ages. The word probably comes from the Latin verb mereri (worthy, earned). Following topics discuss Johannes Calvin's theology and his support of token use; the use of Méreau in world-wide Reformed Churches (see also the United States commemorative half dollar of 1924 for the Huguenot - Walloon tercentenary); problems which sometimes developed in requiring tokens to receive communion, and continues on to the retirement of the tokens in most all Reformed Churches in Germany by around 1890. This part of the catalog contains some illustrations (all pictures in the catalog are in black and white), a few documents and a couple charts. The catalog part of the book starts on page 59 with token Nr.1 from Aachen, a German Reformed congregation, and ends on page 97 with token Nr. 53 from Wilhelmsdorf in Frankonia, a French Reformed congregation. A few of the tokens do have A - B - C etc. for varieties. It is not certain that all listed churches actually issued Méreau. Old church records have been searched and indexed for various subjects and where an entry such as "we are running out of tokens for communion," or "it was moved that Elder XYZ secure new tokens," occurs, this suffices for a listing in the catalog without knowing if any tokens were actually produced. It seems that almost all issued tokens are at least quite scarce. Some tokens are pictured but quite a few of the issues which are known to have been issued are not pictured here. Where information is available, cross references are given, including auction offerings (but not with prices). The tokens, often uniface, sometimes have no date or inscription -- only a picture, a lamb or chalice or candle. Inscriptions can be in French, German or Latin. Some pieces list only a church, SANCTE BARTOLOMVS (in Danzig). They are hard to attribute! This catalog will be a big help. And at the back of the book is a 10 page bibliography of religious, historical and a few numismatic works -- including the 1999 catalog of Lester Burzinski. On page 14, footnote 20, Mr. Desel first mentions the work with the statement ..."no copy can be found in the German libraries ..."
For anyone who might be interested, the German Hugenotten Association is online: hugenotten.de. Click on Webshop and then on Bücher. The list of available publications is alphabetical by author. Scroll down to Desel and you'll see the new work. Go down a little farther and you'll find another helpful addition for your numismatic library by Prof. Dr. Barbara Dölemeyer and Desel, "Deutsche Hugenotten- und Waldenser- Medaillen." 1998. 180 pages. Many black and white illustrations. CHEAP closeout price Euros 6.00 plus postage. Ace L. Crookshanks is listed as a "barber - own shop" in the 1910 Census for the Jefferson District of Nicholas County, WV. Per the header on the Census page, he was living on "Twenty Mile Road" and not in an incorporated place. The 1900 Census lists an Add L. Crookshanks in the Grant District of Nicholas County, but he is shown with no occupation. Both of these listings appear to be for the same person as he was born about 1880 in WV. 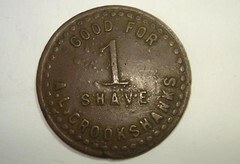 The WV Death Index shows Asa L. Crookshank, a retired barber, who was born 13 Jul 1880 in Nicholas County, WV and died 3 Jul 1963 at Belle, Kanawha County, WV and was buried at Charleston, WV. The WV Marriage Index shows Asa Lee Crookshanks was married in Nicholas (County), WV in 1909. Asa Lee Crookshanks registered for the draft in 1918 and said that he was a self-employed barber in Chelyan, Kanawha County, WV. The 1948 Charleston, WV City Directory shows Asa L. Crookshank working as a barber in Rose's Barber Shop. As you can see, there are any number of variations in the spelling of his name, but I do believe that it was Asa Lee Crookshanks - that matches his signature on the draft registration. It is entirely possible that he had this token purposely made as a maverick, knowing that he might be moving from place to place. It looks to me to date from 1900-1925, give or take. I'll defer the attribution of this token to David Schenkman, the WV Cataloger, but I'd think Chelyan would be a good choice. I should note that this is not listed in Dave Schenkman's fairly new catalogue West Virginia Merchant Tokens, so possibly he wasn't confident of the attribution, or the token info came to light very recently. The 1900 Census shows him living in Nicholas County, West Virginia - no occupation is shown. The 1910 Census shows him living in Nicholas County, West Virginia - barber/own shop. His 1918 Draft Card shows him living in Chelyan, Kanawa County, West Virgina. He is a barber, working for himself. The West Virginia Duns would be the best option to trace where he was during which years. He obviously moved around as a barber between Nicholas and Kanawa Counties. Asa passed away in 31 May 1963 in Belle, West Virginia. Asa Lee Crookshanks was a barber in Nicholas County and Kanawha County, West Virginia. Asa born July 13, 1880, Nicholas County, WV. Died May 31, 1963, age 82, Belle, Kanawah County, WV. Buried Tyler Mountain Memory Gardens, Cross Lanes, WV. Asa was one of 9 children of William Madison Crookshanks (1852-1932) and Nancy Eveline Fitzwater (1856-1937). Father was farmer and worked saw mill as did Asa's siblings. Everyone in family born West Virginia. Asa married 1909, Nicholas County, WV - Sadie Mae/May Keith. They had 6 children. 1900 US Census - Asa, age 19 - farm hand Grant District, Nicholas Ciunty, WV. 1910 US Census, Asa, age 29, is barber with own shop Jefferson, Nicholas County, WV. 1918 WWI Draft Registration: Asa is barber Chelyan, Kanawha County, WV. 1930 US Census - barber in Malden, Kanawaha County, WV. 1942 WWII Draft Registration - barber living Belle, Kanawha County, WV. 1948 Charleston, WV Directory - Rose's Barber Shop. Crookshanks is a surname most commonly found in WV of all the States. Kanawha County is where the capital of WV, Charleston, is located; but Asa Lee Crookshanks always lives south of Charleston, WV. Nicholas County neighbors Kanawha County. Actually, the dies were purchased from the Goetz family many years ago, but were recently consigned to our sale by their owner." To be most accurate, the clarification should read, "Actually, the dies were sold by the Goetz family many years ago, but were recently consigned to our sale by their most recent/current owner." This material has been owned by at least four entities since it was sold by the Goetz family. I am trying to convey to Goetz collectors that these lots have essentially no provenance from their creation dates 90-100 years ago until today. With the exception of a general sales date sometime in the early 1970's by Guido Goetz to a dealer, we know nothing more. Reader Leon Saryan nicely pointed out that the signature of renowned collector L.G. 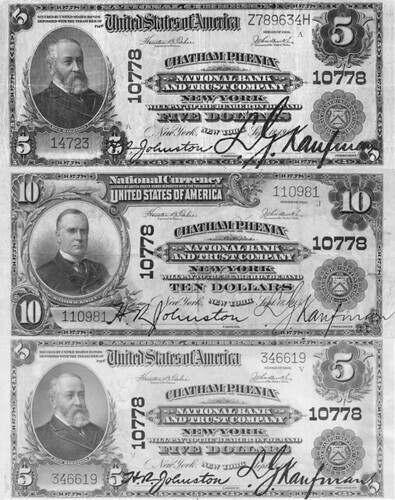 Kaufman appeared as president on the national bank notes issued by the Chatham Phenix National Bank of New York, and he provided a nice example from the Series of 1902. They also appear on the 1929 notes issued from the bank. Kaufman’s signature also appears on his home town Marquette, Michigan, notes where they were current from 1908 through the end of the national bank note era in 1935. The First National Bank of Marquette adopted trust powers in 1925, so his signature transcends the title change to The First National Bank and Trust Company. I am attaching examples of his Margette notes to round out your tale concerning his concurrent Michigan and New York presidencies. 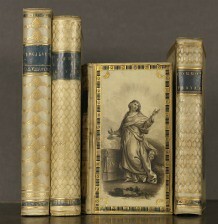 two titles of Kaufman’s Margette bank. The Chatham Phenix side of the story involves a totally unique occurrence that resulted from a mistake that was costly to the bank. National bank legislation was amended in 1920 to allow the use of signatures engraved directly on the printing plates at the Bureau of Engraving and Printing as a concession to bankers who were getting tired of having to either sign or rubber stamp their signatures on their notes or have them overprinted by local contractors. This was a Godsend for large banks such as the Chatham Phenix. There was a $22 one-time charge to the banks to have the bank signatures added to each existing plate combination used to print the notes for the bank. Of course, the officers of the Chatham Phenix bank jumped at the change and requested that their signatures be added to their plates. But things did not go smoothly. One of the clerks in the Comptroller’s office, at the request of the officers of the bank, placed an order with the Bureau to add engraved signatures to their 5-5-5-5 and 10-10-10-20 plates. The order was logged in at the Bureau July 26, 1926, and included charges to the bank of $284 ($120 per plate and $22 per added pair of signatures). It is clear that the Bureau clerk was logging in charges for both plates and engraved signatures, but the work order specified only signatures. A note in a plate history ledger maintained by the Bureau states that the order was canceled August 12th, the reason being that the existing plates were worn, and replacements would be ordered shortly. The Comptroller’s office submitted a second order on August 16, this one for the needed replacement plates. However, by then, the first order for signatures had been canceled, so no work was undertaken, and the plate order was rejected. Replacement plates were again ordered on August 23-24, but this order failed to include the signatures. The Bureau executed this order. Soon, as the bankers began receiving their sheets, they discovered their notes still didn’t have signatures. The solution settled upon was to overprint the darn things at the Bureau. This is the only time this service was ever extended to any bank in the entire country. The overprinting plate was ordered at a cost of $40, and put into service during December 1926. In time two additional overprinting plates were needed before the close of the Series of 1902 in 1929. The Chatham Phenix bank was billed an extra $2,593.85 for the honor of being the only bank in the country to utilize Bureau overprinted signatures between 1926 and 1929. These charges were calculated at $4 per 1,000 sheets, plus the costs for the plates, respectively $2,473.85 plus $120. Had the initial July 26, 1926 request to add engraved signatures to the existing but worn plates been executed, the bank would have incurred a one-time charge of $22 per plate, $44 total, and been done with the matter. Three signature overprinting plates were made at the BEP for the bank, the second and third being identical. Notes from the two BEP varieties are shown, along with a note with signatures overprinted by a private contractor prior to BEP involvement. Kaufman’s signature is particularly large on the contractor notes. Q. David Bowers supplied the following information. "Louis Kaufman, and his brother Nathan, born in Marquette, were serious, accomplished coin collectors. When Nathan died in 1918, Louis consolidated the collections into one, and named it the Nathan M. Kaufman collection. The collection was renowned for rare Colonial coins and U. S. and private territorial gold coins. Louis placed it on exhibit in the Chatham-Phenix bank in New York. When he returned to Marquette to build a new bank building, he had special wall safes and display cases built to display it. The collection was moved there where it remained for decades. Louis died in 1942." I found it particularly ironic that Louis Kaufman, the consummate numismatist, happened to be center stage in the production of a totally unique numismatic variety involving the overprinting of his signature on 1902 series Chatham Phenix issues by the BEP. He had no idea that this distinction had befallen him, and it is doubtful that he included examples of the notes with his signature in his coin collection on display at either the New York or Margette banks because at the time national bank notes simply were ordinary objects of little interest to numismatics! Little did Kaufman know that someday avid currency collectors would discover this odd tale and avidly chase the notes signed by him, and cherish them as much as he cherished his gold coins. The Chatham Phenix National Bank and Trust Company was the only bank to utilize bank signatures on large size notes that were overprinted at the Bureau of Engraving and Printing. Top note: early signatures overprinted by a private contractor. Middle note: signatures from the first signature overprinting plate made at the BEP. Bottom note: signatures from the second overprinting plate made at the BEP. The signatures on the third BEP overprinting plate were the same as on the second. Kaufman’s signature was current on the notes from the Chatham Phenix bank from 1910 until 1932 when the bank was liquidated. The photos used here are courtesy of the Heritage Auction Archives (HA.com) and the National Currency Foundation (nbncensus.com). I read Dan's comment in your last issue (August 25, 2013) and would like to help him by noting that the book we were looking at that day was a Massachusetts Bay Colony book of conversion tables published in 1750. It showed the value in lawful money of various Old Tenor amounts and helped to simplify money calculations caused by the inflation of the prior decade. I apologize for distracting Dan with the coins because the book is indeed a beautiful rarity. All best. My dad and mom did indeed witness the scuttling of the Graf Spee from their honeymoon cruise ship in the harbor of Montevideo in 1939, but they were not active participants in the way Dan implies. There is also a numismatic twist to the story, since Eric met someone on that cruise who played a role in his acquisition of items from Colonel Green. My folks are looking forward to their 74th anniversary in a few months. The ANA was awe sum! Spent 10 days in Chicago and saw so many cool things. I, too, visited Eric's vault about 10 years ago and was stunned at the Bust coinage (I saw the dimes, quarters, half dollars, and dollars). 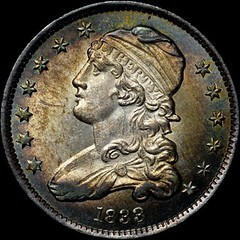 I offered Eric $250K for his 1799 (now graded 67 and the BEST Bust dollar on the planet, in my opinion). Collectors can go to the NGC website beginning with 2037631-001 to see the grades on these pieces although they are not imaged there. The proof quarters from 1860 forward, for example, are all extremely high graded. The 55th Baldwin-Ma Tak Wo Hong Kong Coin auction, held at the Holiday Inn, Kowloon, on the 22nd August, proved to be one of the most exciting in the Groups history. 1187 lots went under the hammer, including lot 580, a sensational Sinkiang Province, 1898 Sungarei Silver Dollar. One of the rarest of the Chinese milled dollars, and missing from most major Chinese coin collections, this lot contributed a great deal to the hammer total of US$1,182,897 (inclusive of Buyer’s Premium at 18%). Amid much speculation about the coin, a disclaimer in the auction catalogue stated that the coin had not found favour with the two main grading companies, lot 580, sold for an outstanding US$206,500 (inclusive of Buyer’s Premium), over double the pre-sale estimate. Recent research reveals that the Sinkiang “Sungarei” dies were made using generic punches and hubs in common with the Anhwei, Chekiang, Fengtien and Heilungkiang series of dies manufactured by Otto Beh during the period 1897-99. As a total of 260 dies were made, not counting the rejects, the wear and tear on the punches and hubs explains the softness or lack of details on some of the patterns of the above series. The smaller denominations of the Sungarei series have been found in heavily circulated condition. The coin was bought by a mainland Chinese buyer present in the room. 508 bidders in the room, online and on the book participated in the auction where Baldwin’s auctioneer, Graham Byfield, took to the rostrum for the first time at a Hong Kong auction. No other Chinese coin came close in price to the Sungarei Dollar. It was clear that more common coins were not in great demand, though many sold for sensible prices, including lots 641 – 644, a selection of 1932 Silver “Junk” Dollars which all sold well at just over high estimate. Chinese paper money was in limited demand, with the local trade clearly not investing in stock. A good quality run of the mill material sold erratically but exceptional prices were achieved for selected items including lot 208, a 1953 People’s Bank of China, 10-Yuan note. Estimated at US$2,500 – 3,000 the banknote sold for US$15,000. A small selection of Sycee proved popular with lot 407, a Yuan Dynasty Silver 50-Tael Sycee selling online to bidder from Europe for US$34,000. The collection of Chinese orders and decorations also sold well, as did the specialist collection of SE Asian plantation tokens. The highest prices were for Indonesian locations, while Borneo found less favour. Lot 704, the Good Luck Fantasy Tael, featured on the cover of the auction catalogue, was inspired by ancient Chinese design. Depicted on the reverse is a ring of bats surrounding a central symbol which signifies longevity, whilst the bats are representative of good fortune. The Tael brought a strong US$3200 against an estimate of US$400-500, such is the price of good luck and longevity! The catalogue and full results from this auction can be found online at www.baldwin.co.uk/hkca55 . 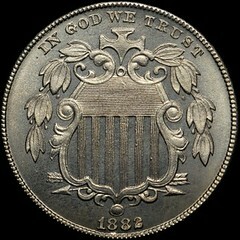 I was one of the group of authenticators that attributed the first "silver plug" Bust dollar. My understanding of the process was that the underweight planchet being so treated was pierced in the center with a sharp instrument, such as an awl, that pushed metal aside without removing any metal, or removing very little. The plug was then placed inside the hole so created and tapped with a hammer, mushrooming it out on either side (similar to a rivet) so that it would not fall out of the hole as it was being placed in the coin press. 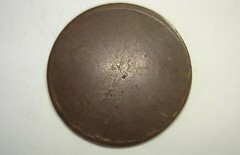 The now-heavier planchet was re-weighed and adjusted back downwards if necessary. When the planchet was then struck by the dies the excess metal in the center of the planchet would spread outwards, and any gaps between the planchet and the plug would be filled in. As to the question about the silver plug in the 1794 SP66 dollar, Chris Pilliod just wrote about the research he did on a 1795 dollar in the most recent issue (August 2013) of Longacre's Ledger, the Fly-In club journal. He proved what we all suspected. The plug hole is very small and the piece used for the plug is longer than the hole (it was cut to the proper length, per the weight needed) and was smashed down before the coin was struck. Thus, the amount of silver added is more than that removed, bringing the planchet to proper weight. 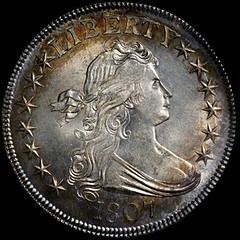 I have spent many hours with the "special" 1794 silver dollar, of which much has been written. 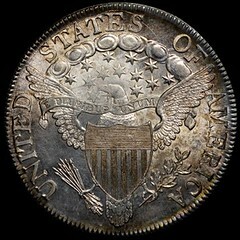 There is debate as to why the 1794 dollar contains both a silver plug AND adjustment lines. Was it lightweight and a plug was added increasing its weight to over the required amount, requiring filing to bring it down to proper weight? Was it too heavy and they filed it too much and had to add a silver plug to bring it back to standard? I have published another theory on several occasions. Both the above scenarios seem unlikely to me, so I believe this dollar was a "regulated" silver coin, just as Brasher and others regulated gold coins. 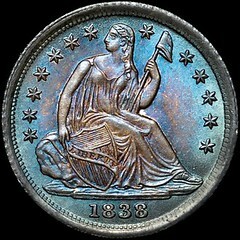 I believe that the Mint was saying: we are going to produce coins of correct weight and fineness. There is debate on this point, of course, and I have no proof (pun intended) that this is the case. 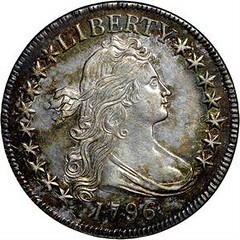 However, those who have examined this coin realize how special it is – as noted by me and others in The E-Sylum and elsewhere, I believe this is David Rittenhouse's personal specimen and is the first silver dollar struck (right after the copper die trial). There is no proof (yep, very punny or is that, punnie?) of this, but this is the only SP 1794 dollar, as well as the only pre-clash example other than the copper die trial. Martin Logies and others have looked for other State a (State I, per Logies) examples and have found none. Why would they select this planchet to polish and strike a special coin? I believe the only logical answer is the one noted above. You won’t find any signs marking the location of the Northwest Territorial Mint. This is the largest private mint in the United States. It produces coins for several foreign countries, gold and silver bullion coins, bronze stars and most other medals for members of the military, the Boy Scouts and the Veterans of Foreign Wars. With this kind of wealth lying around, one doesn’t make it easy for unsavory characters to discover the mint “at the end of a road to nowhere,” said Rob Vugteveen, special assistant to the company’s CEO and founder, Ross Hansen. While there are no Northwest Territorial Mint signs outside the building, there are Medallic Art signs. They make it sound like the building houses some kind of art supply or trophy business. Northwest Territorial Mint was founded in Seattle in 1984 by Ross Hansen, who still runs the company. In 2009, the company purchased the Medallic Art Co. facility in Dayton. The company, long based in New York City, has been producing medallions since 1903. Hansen moved most of Northwest Territorial Mint’s production operations to this facility. According to Vugteveen, Hansen had been an investor who was disappointed in the quality of bullion coins. Some of the mint owners from whom he bought coins said if he thought it was so easy, then he should do it himself. 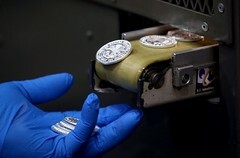 Many of the silver and gold investment coins are individually minted by applying 600 tons of pressure to the blanks. All coins go through a polishing process to ensure they sparkle when they reach the hands of buyers. Even before someone carefully removed a windowpane from a secluded Buckhead home here one rainy June night and slipped away with a 1734 silver mug that had belonged to George II, it was clear to detectives that a meticulous thief with a singular obsession was stealing the great silver pieces of the Old South. For months, exquisite sterling silver collections had been disappearing, taken in the dead of night from historic homes in Charleston, S.C., and the wealthy enclaves of Belle Meade, Tenn. Nothing else was touched. The police in different states did not at first connect the thefts, some of which initially went unnoticed even by the owners. But as the burglaries piled up, a retired New Jersey detective watching reports on the Internet recognized a familiar pattern. Early Monday, outside an apartment building in the tiny northern Florida town of Hilliard, the police arrested Blane Nordahl, 51, the man they believe is connected not only to the recent Southern silver burglaries but also to 30 years’ worth of antique silver thefts in several states. He was charged with burglaries in Atlanta and will most likely face charges in other states. In one of the biggest recent hauls in which Mr. Nordahl is a suspect, a thief disabled the alarm at the Cooleemee Plantation House in North Carolina and walked away with silver spoons forged by Paul Revere and a coffee and tea set that a slave had once buried for safekeeping when Union soldiers moved through during the Civil War. Detectives who chased Mr. Nordahl for decades say he is responsible for crimes that have had him in and out of prison since the 1980s. He might ultimately be responsible, they say, for more than 500 burglaries that netted him several million dollars’ worth of some of the best domestic silver pieces in the country. The numismatic collection is housed in the Collins Barracks location, just off Benburb Street and, if you avail yourself of Dublin’s LUAS tram, you will actually stop right outside the Barracks itself. The first thing you need to know or will notice about Collins Barracks is… it is huge! This part of the National museum is a renovated former Army barracks built three centuries ago in 1702 and further extended in the late 18th and 19th centuries. 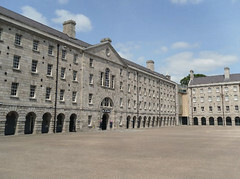 Prior to its award winning redevelopment and conservation renovation, the barracks was once the oldest, continuously used military complex in the world. Since 1997 it has been the new home to several collections. An interesting fact about Irish coins is that they do have a similar timeline as those of several Scandinavian countries such as Sweden, Norway and Denmark. There are coins on display which can be dated to the very last years of the first millennium, around 998 and right up to the most recent coins denominated in Euro. The collections are displayed in well-lit, welcoming and spacious surroundings. 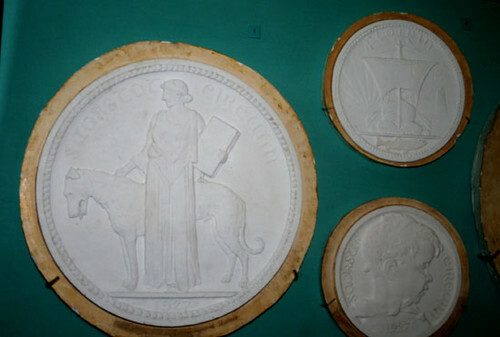 As you enter the complex where the collection is housed, you are met with a real piece of Irish numismatic history, the very plaster mould which Croatian sculptor Ivan Mestrovich (1883-1962) submitted to the Irish coinage committee in 1927 but, as the story goes, the model arrived too late for consideration. This beautiful depiction of an allegorical female figure with harp most probably would have been utilized for the common reverse sides of Irish national coinage – and as it turned out, the design was adopted and used as the great seal of the Central Bank in 1965. This extraordinary object of numismatic art eventually did make its way onto an Irish coin (as had been intended) in 2007 when a silver commemorative coin was issued for collectors. Another room which is part of the collection contains an extensive collection of Irish and world medals, including an actual gold Nobel Prize medal. 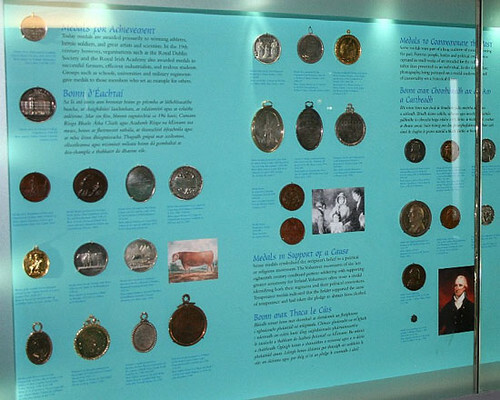 The national collection includes several pieces of the coins issued under King Henry VIII, Mary I and Elizabeth I. Henry’s Groat or silver four pence is on display as well as Mary’s & Elizabeth’s shillings – all carrying the now familiar harp on the reverse of the coins – a tradition which continues to this day. post-independence, the subjects are wide ranging. During the period of the Great Rebellion in Ireland and the English Civil War a number of crudely made coins were produced in Ireland, mostly in Dublin. These coins were almost exclusively of silver plate cut and struck into a number of denominations with simple patterns which often included their weight or value in their design. Of interest is a display of “Blacksmith’s money” which was minted during the Cromwell era. Included is an excellent example of a Kilkenny half-crown based on the English coin of the same denomination – the differences could not be more startling! Another fascinating inclusion is that of the Ormond pieces, issued by the Lord Justice the Earl of Ormond in about 1642-1645. 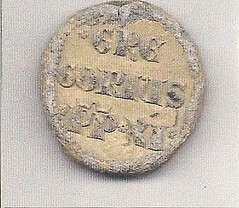 Papal Bullas are now being found at the Baltimore coin shows. Although not a coin or a medal, why are they sold from a dealer's case? Being a collector of items considered "off the wall" in the numismatic world, I collect such items as love tokens, 18th century calendar tokens, game counters, communion tokens, etc., I have always had an eye for the unusual with a story. 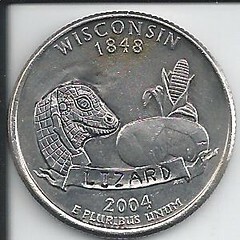 In 2006 I went to the spring coin show in Baltimore. While at a table "The Sentry Box", I was speaking with Chris Maniscalco ( a well respected and top shelf dealer ), when I noticed an unusual shaped item in one of his cases. I quickly pointed it out to him. Chris handed it to me. He described the piece as a "papal bulla". Oh, this was something new. I had to know more. He told me it was a seal the pope used to authenticate a letter he had written. Needless to say, I had to buy it. On my return trip home, it dawned on me that maybe I had one in an old box of coins and items left to research I had put away. With further investigation I discovered that I did have one and didn't know what it was for over 5 years. The piece I discovered was in fact a bulla from the 14th century. It had been used by Pope Gregory XI. The bulla gets its name from the seal on a "papal bull". The bull, simply put is a statement that the pope makes that clarifies an issue of doctrine, a statement that defends the Catholic Church against opposition or an official position on an event. Before the 14th century the term "bull" referred to "decrees" (issues affecting the entire Catholic faith), "constitutions" (instructions to a region or the whole faith), "encyclicals" (letters to bishops), and "decretals / rescripts" ( replies to a specific issue and letters of answer). The bull lends itself to the seal that makes the document official. From its conception, the seals were made from metal, usually lead alloy. To the eye of the day, it looked like a bubble of boiling water. Hence, the Latin word "to boil" is "bullire". With this authentication made by the pope, the documents consequently were referred to as "bulls". The seal itself was called a "bulla". Pope Gregory XI reigned from 1370 to 1378. During his reign as pontiff, enduring measures were taken against burning at the stake and property confiscation. This was widely accepted in England, Germany, and various parts of Europe. To this, he wrote many decrees, decretals, and rescripts explaining the position of the church. This, however, is another story. The bulla pictured here is between to 635 and 643 years old. 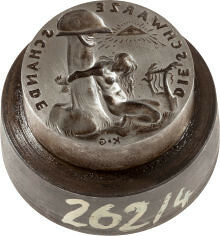 The common practice was to either run a silk or a hemp cord through the center of the seal. A silk cord for letters of instruction or reply and a hemp cord for excommunication were most often used. At the subsequent shows in Baltimore since 2006, I have found 4 more bullas at 3 different dealer tables. A very affordable artifact for such a valuable history. Although not necessary for market adoption, as the Bloomberg testing demonstrates, recognition of a bitcoin code by a market-based standards organization such as ISO would set the stage for increasing market depth and liquidity of bitcoin trading. Members of the Bitcoin Foundation, the trade organization that represents the virtual currency that approximates cash on the internet, are having a series of "educational meetings" today with politicians, regulators, law enforcement officials, and federal agencies including the Department of Homeland Security, Treasury Department, and Federal Bureau of Investigation. The overall message that the Foundation is trying to send is that Bitcoin has proven itself to be a useful and enduring tool, and that the US will suffer competitively if the currency becomes illegal or too onerous to use under American law. In March, a division of the Treasury Department announced that certain Bitcoin businesses must register with the federal government, a requirement the Foundation says would be crippling for many startups. FinCEN, the Treasury agency that issued guidance about how US law affects Bitcoin, is hosting the summit. The agency has been in talks with the Foundation for months to organize the event. According to the Foundation, attendees will include high-level representatives from FinCEN, Internal Revenue Service, Federal Deposit Insurance Corporation, Federal Reserve, Office of the Comptroller of the Currency, FBI, Drug Enforcement Administration, Secret Service, and Department of Homeland Security. The Foundation will also be meeting with legislators on Capitol Hill separately tomorrow. 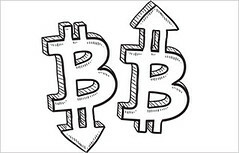 Apparently a neologism "bitcoin" has the eye of the Federal government! On Wednesday, Oxford Dictionaries announced it had added a number of new words, many of which were born of a distinctly digital era, into its online lexicon. “With influences ranging from technology to fashion, there is something for everyone in the update,” the organization said in a blog post. The organization reviews and adds new words each quarter, along with their formal definitions. This time, the organization added more than 60 new words and terms, including “bitcoin,” the upstart virtual currency that has attracted the attention of federal regulators; “emojis,” the colorful cartoon characters that can replace words in text messages; and “selfie,” a self-portrait taken and then uploaded to a social media site like Facebook or Instagram. Everything you need for your currency collection. Click here for free shipping over $50. The first 1,000-lira notes issued by the Turkish Republic, which are the most unique banknotes of the republic’s history, have been found in a private collection. There are two unique first-issued banknotes that were kept in private collections separately. They have now been brought together in a single collection. Necati Doðan, researcher and writer, spoke to Anadolu Agency about the value of the banknotes and why they were very valuable and their significant place in history. 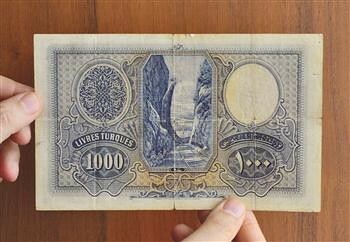 The banknote, which is the first 1,000 liras to be issued by the Turkish republic, was accepted in 1925 and later, after two years, it was issued in England’s “De Thomas De La Rue” printing house and put into circulation in 1927. A total of 15,374 banknotes were issued and in 1939 it was withdrawn from the circulation, Doðan said. A total of 23 of these banknotes have been sent to the Central Bank to be changed in the ancient times. While these changing procedures were taking place, only six or seven of them remained sturdy. “That’s why these two bank notes are very valuable for us,” Doðan added. The banknotes are 124 millimeters in width and 201 mm in length, and they are dark blue in color. The front of the banknote displays the portrait of Atatürk and the back part of it shows Sakarya Train line and Geyve strait. When the republic was established, the banknote was the most valuable bank note of the republic era and it was published during the establishment of the republic, making them more valuable than the other banknotes. Doðan said it was issued before the alphabet reform and that’s why “Turkey Republic” was written in Ottoman Turkish on the front of the banknote. The watermark part of the bank note displays the Turkish Republic’s emblem. The Library of Congress no longer needs the computer room that visitors once used to search its electronic card catalogue. These days the entire library has a wireless Internet connection, so workers this summer put a collection of old microfilm machines in that room instead. Meanwhile, the library’s old-school physical catalogues, the kind filled with carefully penned index cards, have long since been relegated to cool basement hallways where schoolchildren marvel at their obscurity. “I told them, ‘Before Google, this is what we used to do,’ ” said Fenella France, the library’s chief of preservation research. “They had never seen [card catalogues] before. These are some of the several quiet moves that hint at much larger changes underway at the Library of Congress. As libraries adapt to an increasingly networked and digital world, leading institutions are rethinking their use of physical spaces as well. At the Library of Congress, that means consolidating multiple reading rooms and making the experience of in-person researching more like the kind of one-stop shop we’ve come to expect online, a controversial plan that’s still being debated. At the same time, planners are trying to make online presentations feel more intuitive by designing collections of photos and navigation tools on the library’s Web site so that they operate like Facebook, Amazon.com and other popular sites. Digital and physical changes play off one another. For the first time in 40 years, a small team is also reinventing the way the library catalogues re­sources, developing a system that’s designed to become the new global standard. Elsewhere in the library, staffers are creating the institution’s first holistic online strategy of the Internet age and restructuring its stable of Web sites. Other institutions face similar tensions between past and future. The Bodleian Library at the University of Oxford, for example, has been around for more than 400 years, twice as long as the Library of Congress. Back at the Library of Congress, staffers are for the first time focused on how to serve people who might never set foot in Washington. That means considering how physical and digital spaces are being integrated and adapting library resources for use in physical spaces outside of the building. “Like if I’m on a mobile phone and I want to see what photos the Library of Congress has of places near where I am standing right now,” Kellum said. This week's Featured Web Page is an article on the communion tokens of the United Presbyterian Church Of Tarentum, PA.
A few years ago, I was looking at a copy of a newly published book, Communion Tokens of the United States of America. 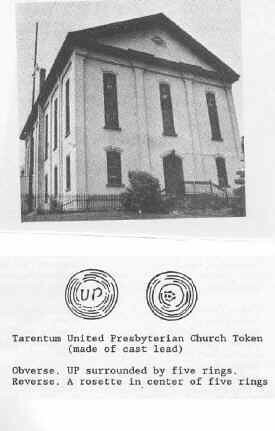 As I came to the section on Pennsylvania tokens, I was surprised to learn that one church in my hometown, the United Presbyterian Church of Tarentum, had used communion tokens. After nearly five years of searching, I was finally able to locate a Tarentum token.